The founders of Sombrero© have a combined experience of American and Mexican cuisine for over 20 years. We developed this western concept in 2011 with merely a simple ingredient... the passion to enjoy authentic Mexican foods. While living in the States for all those years, our experience was very much influenced by great chefs, such as Rick Bayless (USA), Zarela Martinez (USA), Ana Garcia (MX), Thomasina Miers (UK) and others whose speciality are in cooking authentic Mexican cuisines. We'd further instilled such experience by visiting many small family-owned Mexican restaurants found throughout America. We're definitely far from the culinary experience and artistry of the aforementioned chefs. In spite of that, we're humbly striving, as we're learning to deliver the colorful and refreshingly tangy (picante), spicy and warmth Mesoamerican-Spanish taste and ambience to our diners. Our hopeful goal is to be able to immerse our patrons' dining experience, even for a moment to the vibrant and rich Mexican culinary culture. We're continuously introducing ever more authentic Mexican delights to our menu. 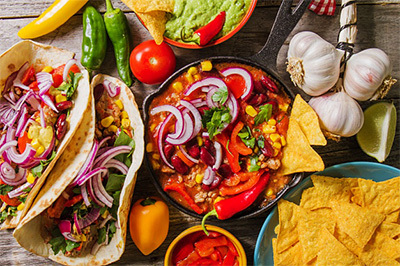 Traditional Mexican cuisines have always been healthy for having a good "balanced diet" of meat, poultry, beans (high in good protein), corn (staple of Mesoamericans), tomatoes (as in salsa), guacamole (derived from avocado), cheese (as in natural cheese rather than highly processed cheese), chili peppers (real chilies have proven to lower bad cholesterol when consumed in moderate amount) and others. We also pay attention to using as natural (minimally-processed and some are even organic) quality and authentic ingredients as we possibly can even at our outlets that are serving "fast" Mexican foods. If we've learnt that our local suppliers are not able to meet the authentic Mexican quality, we will opt to use imported ingredients. Being Muslims in the F&B industry, it's our utmost responsibility to assure halal and hygiene of our ingredients and in food preparation methods. For our fans who have been eating at Sombrero© since 2011, we're grateful for your genuine support and feedbacks. We've read and comprehended all your positive, as well as some negative feedbacks.